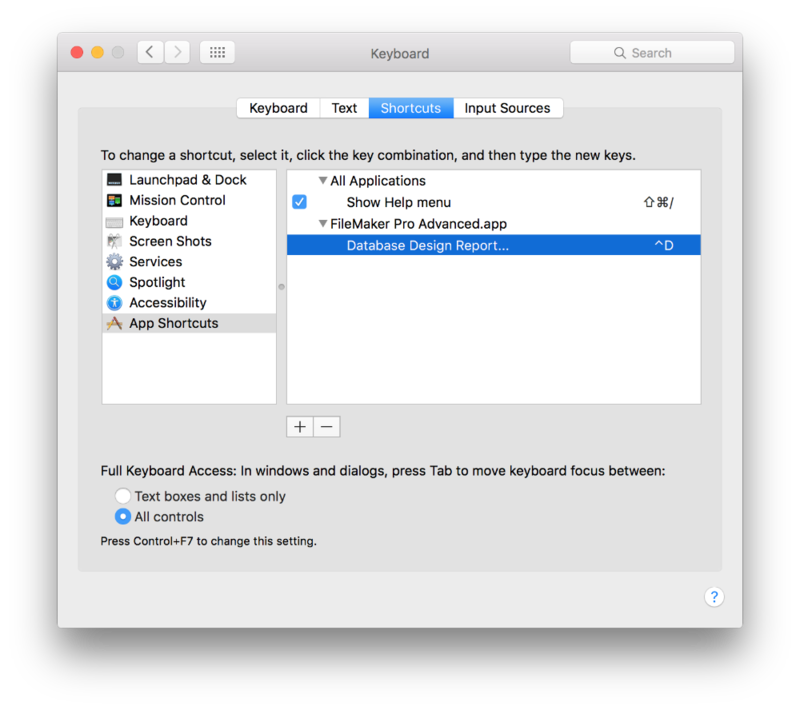 On Mac OSX, use the Keyboard system preference to set a shortcut. A common option to use is Control-D. See image. It only functions in FileMaker Pro Advanced, as it controls the DDR creation interface. It will not allow you to create a DDR using FileMaker Pro or FileMaker Server. The folder you want to export to has to exist. The provided example tries to create a folder on the desktop called "CURRENT_DDR". FM.RunDataDesignReport can't tell when the GUI is done exporting the DDR, so it can't cleanly continue with the script after exporting a DDR. The FM.RunDataDesignReport command has to be your last step/command. That said, this function combined with the FMPerception Refresh [DOCUMENTATION LINK NEEDED] feature allows you to refresh your DDR metadata extremely quickly. Here's a sample file with an example implementation. Please note that the script includes space for the registration code for the MBS plugin. You'll have to fill in your own registration information before you can make use of this. You could open this database at the edge of your display, and just click the Export DDR button whenever you want to export DDRs for all currently open databases. You could copy the script to your target database, and either reference it as a custom menu item, or set it as one of the first 10 scripts so that it can be invoked using a command-key combination. Disadvantage: You have to modify the target system, and leave it modified if you'd like to continue rapid generation of DDRs. You can use AppleScript to completely automate the process on the Mac. AutoRefreshDDR from Geist Interactive on Vimeo. Here is an Automator action you can use. When you launch it, it will ask you to install as a service, which is what you want to do. John Renfrew,( john@e-rwu.com, @att_it_ude), created the Applescript we are using and it is available on github. You will need to allow Automator and Script Editor access to Accessibility in the Security System Preference. The first time the script is run it will usually prompt you to allow access.